Hospice care is designed for upholding the comfort, dignity and emotional wellbeing for patients with life-limiting illness. With the primary focus on the patient’s needs, caregivers may not realize the services available to them to cope with the transition and bereavement. Education: Your home healthcare provider brings a wealth of knowledge and experience to each case. No question is too simple or complex when it comes to the care of your loved one. Seek information and resources specific to your situation, and through each stage of the process. 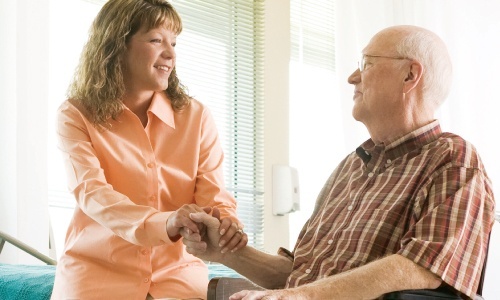 Respite: When you need a break from caregiving, your provider can connect you with respite options offering around-the-clock care of your patient for a specific number of days. Personal care assistance: There are support services available that can lessen the burden of daily tasks associated with caregiving. These can include household items like cooking, cleaning and personal patient care, as well as transportation, errands and medication management. Companionship: As your loved one’s constant companion, you are pulled from your existing obligations and outside interests. Patients can receive support from aides and volunteers in the form of companionship while you attend to your personal needs. Financial and legal guidance: There are resources available to you from your provider on the legal and financial management surrounding life-limiting illnesses – and at the times you need it most. Art therapy for families: Hospice care in the home affects all family members: young and old. Art therapy is a means to help individuals, especially children, express their feelings and confront the changes in front of them. Pre-bereavement counseling: The grieving process can start before a loss. Families need emotional support at each stage to help prepare for the inevitable and make each moment count with the patient. Spiritual support: Whatever the feelings or religious denomination of the patient or family, people find strength in Hospice situations through spirituality and reflection. End-of-life arrangements: After a loss, your provider can help with the large responsibilities to the smallest details of arrangements: funeral planning, notifications, and long-term bereavement support and counseling (as long as 15 months after a loss). As part of your overall Hospice care plan, it’s important to understand your options, and take advantage of the support services that provide peace of mind in your difficult circumstances. Learn more about Visiting Nurse Association of Ohio's hospice services, or call us today at 1-877-698-6264.